Several commentators have expressed concern about my previous post. After thinking the matter through, I realize that it was probably wrong of me to post it, knowing only one side of the story. I've removed the post until I know more about the matter. My apologies to all. Last night was the Bar Mitzvah Se'udah of my oldest son. It was (if I may say so) a nice affair - the music was good, the number of people was small (by New York standards, anyway) and the food, as I was told, was delicious. Since no one likes to listen to speakers, we kept it at a minimum - I spoke for about four minutes and the Bar Mitzvah boy spoke for about five - and that was it. I spent some time at all the tables on the men's side and managed to spend "quality time" with just about all the guests. The downside of that was that I really did not get a chance to eat too much. I ate part of one course with some friends, part of the barekas with family members, part of the main course with an old rebbe of mine from elementary school who I've kept in touch with (he was the Bar Mitzvah boy's sandek thireen years ago), and desert with my sister's father-in-law and his son-in-law (my brother-in-law's brother-in-law [or, as I like to say, my brother-in-law once removed]). But, in reality, I didn't eat much of anything. By the time we got home, we were exhausted. Kaput - and it was only about 9:30 (we started earlier because we wanted to have kids at the se'udah and have people stay as long as possible). Not too much longer after we got home, I got into my sleeping attire (pajama bottoms and a T-shirt - don't ask) and was ready to settle in for the night. However, before I was going to do that, I was going to get something to eat - we brought home food and I was hungry! Before we actually started eating, I asked my wife if Rabbi & Mrs. Neighbor were there, since I didn't see them. We were expecting them to come (Mrs. Neighbor had even done Eeees's makeup for the affair), but, in the end, neither one of us had seen them. As if on cue, there was a knock at the door. Before she even got up to answer the door, Eeees smiled and said "it's them." Sure enough, there they were at the door, dressed up, wishing us Mazel Tov. (I quickly threw on a pair of pants over my pajama bottoms!) They had another simcha to go to (a family vort,[engagement party] suddenly called) and apologized for not being there. We invited them in, offered them a chance to sit down. At that point, I said "Listen, I was about to eat something from the Bar Mitzvah since I really didn't get a chance to eat. Why don't you sit have something too?" So, we brought out the challah rolls, the barekas, the potatos and the chicken and served another meal. The Bar Mitzvah boy joined us as well. As we washed and started to eat, I remembered that the musician had given us a CD he recorded at the end of the affair; so I pulled it out and put it on the stereo. The Bar Mitzvah boy said his speech again and he and Rabbi Neighbor even danced for a while (I was all danced out by that point)! Afterwards, we had dessert and bentched (how many Bar Mitzvah boys can say that they led in bentching twice on the night of their Bar Mitzvah se'udah?) and they went on home. In truth, however, although I was ready to plotz before they came, that portion of the evening became one of the highlights of the day. It was nice to have a chance after all the hustle and bustle and greeting and shaking hands and music and photographers and everything else that went into it, to have a chance to sit down with friends and just have a simple pleasant meal. It definitely beat sitting in my pajamas in front of the TV with the chicken. We got to immediately reminisce some of the highlights of the evening and share and laugh about the good (if exhausting) time we had. It was truly a nice end to the Bar Mitzvah day. Well, the Mets lost and the Cardinals are going off to face the Tigers in the World Series. As a lifelong Yankees fan, I've always had a good, healthy hatred for the cross-town rivals. Generally speaking, unless the opposing team is the Dodgers, I'm with whomever the Mets are playing on any given day. That said, yesterday's 3-1 victory by the Cardinals was the outcome I was looking for. However, I began to wonder about the propriety of rooting against the home team. I figured that I don't owe any real allegience to the Mets players - they're making a hefty chunk of change just playing (minimum salary: $327,000, average salary: about $1.5 million), and they're going to make extra money for being in the playoffs. True, the playoff money would be larger if they got to the World Series, but so what? The money would go to either them or the Cardinals anyway - one of them had to win and one had to lose - so what difference does it make? But then I began thinking about the other people involved - the owners of businesses around the stadiums. Since the Mets didn't make it to the World Series, there goes at least tow (and maybe three) days of extra cash in their pockets. In a highly seasonal business where there are only 81 home games in a year, an extra two to three days of business can be a big difference. Then, of course, there are the people who work inside the stadium: ushers, ticket takers, beer and snack vendors, T-shirt and paraphenalia salespeople; all these people work only when there are games. By losing last night, the Mets players cost these people two or three days of wages - about 1/90th of their annual salary (when playoff games are taken into account). That's not chump change to some of these people - that's their livelihood! Parking lot attendants won't be working because people won't be driving to games that aren't being played at Shea. And lastly, let's not forget that playoff games bring in a lot of revenue to the local tax collectors. I remember reading somewhere that if the Yankees or the Mets don't make the playoffs, it costs the city over $10 million in tax revenue. To be honest, of course, the money isn't really being lost - it just shifted from New York to St. Louis. Instead of Shea Stadium ushers being employed, Busch Stadium ushers will be earning paychecks escorting people to their box seats. Instead of New York's tax coffers filling up, St. Louis' will. So, in the end, while it may be a local loss, it's not like it's a total loss - one team had to win and one had to lose. A Mets win would have come at the expense of the people of St. Louis, and vice versa. So, is rooting for either team ethical when one side will lose and people unrelated to the game will have their personal finances made or broken by the events on the field? Can I ethically root for the Mets if it means that some poor parking lot attendant in St. Louis will be out of work? Can I root for the Cardinals (putting aside the fact that I'm rooting against the Mets out of hate) when a Cardinal win will cost some poor pretzel vendor a fair chunk of change? Is rooting for either team ethical? I suppose that there are two ways to look at it. The first way is that rooting for a team (any team) is ethical because, if not for the people rooting for a team, the whole enterprise would fail. Without the fans, no one would watch the games, the television networks couldn't sell the advertising spots to advertisers, the players couldn't get paid and the ticket takers, parking lot attendants, etc. would all be out of a job anyway. So, the fact that I have an interest in the success of one team means that I am helping, in an indirect way, to employ those people. In that sense, rooting for a team (any team) is ethical and productive. That may be fine for the regular season, where each team will play 81 home games (barring rainouts) regardless of the success of the team on the field. But what about the playoffs, where only one team (and the people associated with it) will see revenue? When it comes down to a hot-dog vendor in New York or a hot-dog vendor in St. Louis, does one have a better claim to my fandom? Does it make a difference (ethically or morally) which team I root for? I suppose that, when thought of in those terms, that rooting for the Mets would be the proper course. After all, when it comes to tzedaka (charity), we are taught that all other things being equal, the poor of your home city come before the poor of other cities. That being the case, when it comes to some poor pretzel-vendor here or some poor pretzel vendor in St. Louis, I should be looking to support our own pretzel guy - after all, he's a New Yorker! Take a look at the picture at right. 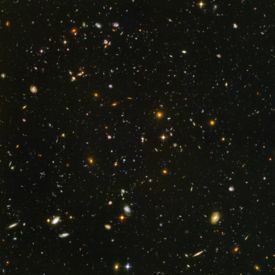 This is an image known as the Hubble Ultra Deep Field. The Hubble Ultra Deep Field (HUDF) is a composite image of a small patch of sky in the constellation Fornax. The area covered is about 3 arcminutes square - or smaller than the amount of sky covered by holding a grain of sand at arm's length. Aside from a few exceptions, all of the objects in this picture are not stars, but galaxies. A galaxy, very simply, is a large collection of stars, usually numbering anywhere from ten million to a trillion. Just about every little point of light in that picture contains millions, or billions, or trillions of stars -- and the whole picture is a miniscule portion of the sky. A star, let us not forget, is not a trifiling thing. We have one pretty close to us - a mere 93 million miles or so. But as far as stars go, our sun is a pitzy little thing - not nearly as large as some stars, certainly not large enough to ever go nova (thank goodness!). The nearest star to us (aside from the sun, of course), is about 4 light years away - that's about 24,689,625,089,476 miles. If you took the space shuttle there, you'd reach there in about 150,000 years. Our galaxy, the Milky Way, contains about 80,000 - 100,000 light years across and contains about 200 - 400 billion stars. In that little patch of sky, there are thousands of visible galaxies, each with it's billions of stars and each thousands of light-years across. Multiply this number by the number that would be visible if you observed the rest of the sky, and you see the wonderousness of Creation. Of course, none of these observations would have been possible without science. Without science, mankind would never have bothered to explore the heavens beyond what is visible with the naked eye. Without science, we would have never discovered the extent of creation that we have: from quantum particles to galactic superclusters - and, I have no doubt, there is more out there to discover. Personally, when I behold Creation - whether it be the image of a distant galaxy, a bird gathering sticks for a nest, a shooting star, a picture of an ameoba or the look in my children's eyes, I can only exclaim "Mah Rabu Ma'asecha Hashem." Scientific observation does not have to lead us away from HaShem. Indeed, it should lead us to Him. Note: You can download a high-res image of the HUDF here. As I explained last year, I didn't understand the rationale behind the song. As it turns out, before the fifth Hakafah on Simchas Torah, the rav of my shul stopped and explained the song's origin. The song, he explained, was written by R. Chaim Volozhin. His rebbe, the Vilna Goan, passed away on Chol HaMoel Sukkos in 1797. He was afraid that the students in his yeshiva would not be able to properly celebrate Simchas Torah having just lost such an esteemed rebbi. He therefore composed this song to show that while Olam Habah (which the GRA certainly attained) was a good thing, celebrating the Torah was also a cause for joy. I'm still not sure that I agree with the implications of the song, but at least now I have a better understanding and appreciation of it. The sign at right hangs in a RW Yeshivish shul Flatbush. 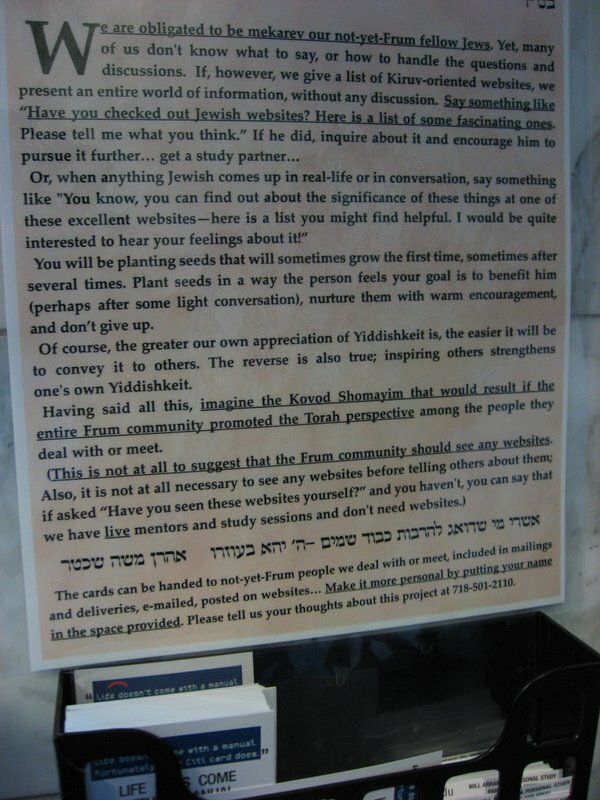 It is a sign that encourages Jews to reach out to their non-frum brethren and encourage them to explore Orthodox Judaism. Interestingly enough, it encourages people to point non-frum Jews to (Orthodox) Jewish websites for information on Judaism. On the whole, I found this to be a rather refreshing approach. 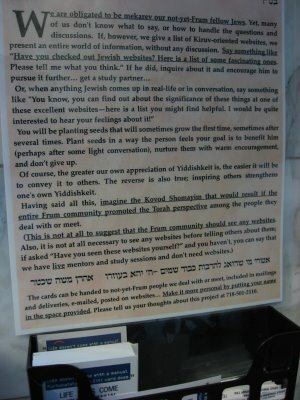 It's not often that you find the Yeshivish crowd actually *encouraging* people to use the internet for Torah learning. They even advise having the prospective frum person come back and discuss what they found on the website. Could it be that the internet might gain some acceptence, even if only for Torah purposes? On the positive, it's a step in encouraging Jews to become frum, and all legitimate methods should be utilized toward that goal, including the internet. The internet houses a bonanza of information about Orthodox Judaism and should be utilized to encourage people to observe the mitzvos. On the negative, however, the disingenuousness of the sign turns me off terribly. The sign is disingenuous in that it encourages lying to the prospective frum Jew. The truth of the matter isn't that the reason that they avoid the internet is because they learn from live mentors - the reason is because they maintain that the internet is a place that frum Jews shouldn't visit. If you want to maintain that opinion, fine - I may disagree with it, but you're free to express your opinion. But don't then lie to the prospective "convert." You're asking them to make a major lifestyle change and a lifelong commitment. The least you can do is be honest with them. There have been those who have been of the opinion that it's OK to "lie" to prospective "converts" to encourage them to keep the mitzvos. Whether it be telling them about "rock-solid proofs" to the Torah (Kuzari, Four animals, etc. ), the sociological aspects of shmiras hamitzvos,("Jewish men don't beat their wives") or anything else, I've always felt that lying does far more harm than good. Eventually, your lie will be found out, and when it does get found out, you'll have taken a person that had a neutral (and positive-leaning) attitude toward Shmiras haMitzvos and turned it into a negative - in the end causing more harm than good - a classic case of "yatza scharo b'hefseido." There is nothing wrong with stating that you don't have the answer to every question, and there is nothing wrong with admitting that frum Jews aren't perfect and have our own share of societal ills. And if you believe that the internet is simply a bad place to be, then don't go there. But don't encourage others to go while you maintain it's not good and then lie to them about your reasons for abstaining. Above all else, be honest - your lies will be found out eventually anyway. On the first day of Chol HaMoed, I went with my family (and some extended family) to Sesame Place out in Pennsylvania. The place was rented out by an organization called the Yeshiva Fund (I have no idea who they are) and accomodations were made for Orthodox Jewish guests (kosher food, sukkos, no mixed swimming [although I actually managed to snap photos of boys and (fully dressed) girls in the same pool at the same time anyway]). The crowd was, in my estimation, overwhelmingly Chareidi. While some Jewish music did blare from the speakers on occassion, the majority of time the music played consisted of Sesame Street songs. While there, I mentioned to a cousin of mine that I was sort of surprised that this event was so well attended by Chareidim, considering that the whole theme of the place was centered on a television show. His response was that the majority of the people didn't know that it was based on a television show. I countered that I was reasonably sure that just about everyone there knew what Sesame Street was. My cousin pointed out that, as far as television shows go, Sesame Street is certainly one of the most harmless shows out there. And, he's correct on that point. However, that doesn't seem to be the way the Chareidi world looks at things. They prefer to take a "ban it all" approach. I remember when the Menahel of my son's school would speak to the parents, invariably he would bring up the subject of television (and he always based it on the same ma'amar Chazal). He would often add "and don't tell me that it's OK because it's an educational show, or it's a nature show, or whatever. It's all tamei." The same applies, of course, to communities that have chosen to ban internet usage. I think that we can all agree that there are television shows, movies and internet sites that children should not see. And, I think that we can all agree that it is the responsibility of the parents to monitor what their young children see and watch. Granted, there are those parents who, out of laziness, ineptitude or simple lack of concern will abdicate that responsibility; but that's no reason to treat the rest of us who do take that responsibility seriously as if we're incapable of doing so. The approach of "it's all tamei" regardless of its content is akin to saying that we should ban knives from homes because some parents are careless about letting their children play with them. Ultimately, no one knows my children better than I do (except for Eeees). No one knows better than we do what is appropriate for him to watch, what he can handle, and what his interests are. The Menahel, if he had his way, would have banned nature videos - but that's precisely the type of thing that my oldest son loves. He has a fascination about the animal kingdom that most children do not have. He reads and educates himself about the animal kingdom all the time. For his sixth birthday, we bought him a five-tape set called "Secrets of the Ocean Realm" which is an adult-level program about marine life -- and he loved it. I think that he's a richer, better rounded person for it. What should we have done? Told him that he can't have an interest in animals because he can't watch videos or read secular books on the subject? Tell him that the subject that he likes the most is verboten? Of course not -- chanoch l'na'ar al pi darko -- and allow him to use his appreciation of the animal kingdom to better appreciate HaShem's wonderous world. But that's an approach that works for him -- and a "ban it all" approach would rob him of that. In short, all such an approach does is make everyone into cookie-cutter versions of the same mold, with absolutely no diversity of thought or opinion. I know that may be the goal in some programs -- but it's utterly wrong. I know that on Succos we are not supposed to hope for rain. Heck, we put off saying Tefillas Geshem (the prayer for rain) until Sh'mini Atzeres so that we can fulfill the mitzvah of sitting in the Succah. And yet, here I am, working in what is probably the only part of Manhattan that doesn't have a kosher resturaunt or a succah. I could travel to another part of the boro by train, but in order to do that and have enough time to get back, I'd have to literally eat like a madman and finish my meal in about five minutes. I wouldn't be surprised if doing so would cause a Chillul HaShem. Eeees offered to buy me a pop-up succah before Yom Tov, but, in reality, I have no place to use it even if I owned it. So, what to do? Well, there are snacks in the snack machine, which is what I subsisted on yesterday. But that's not really enough to last on for the whole day. Add the fact that I often work late and by the time I get home (as I did last night at about 8:45PM), I am H-U-N-G-R-Y! And so, sadly, painfully, I hope for rain during the workday (while hoping for clear nights). Has anyone else actually hoped for rain on Succos so that they can eat a meal inside? A member of our shul made a simcha this past weekend - his son became a Bar Mitzvah on Succos. It was a nice affair - the boy lained, said the haftorah, did a pretty good (although not perfect) job and the host had a crowded kiddush in his sukkah after davening. It could have been a bit more crowded. As it turns out, the host invited guests from Baltimore to stay with him over Yom Tov. However, Friday was progressing and the guests still weren't there. Everyone began to get worried. Finally, five minutes before candle lighting, the host gets a call from the guests that they aren't going to make it. They hit lots of traffic on the New Jersey Turnpike and were still only in Staten Island. However, by a stroke of fortune, they had family who lived in Staten Island and were able to crash by them for Yom Tov. They didn't make it to the Bar Mitzvah, but at least they weren't stranded out on the road for two days with two little kids. Of course, this little affair got me thinking what I would do if I were stranded on the road at the start of Shabbos. It could happen because of traffic, a medical emergency, a car breakdown or any one of a dozen other reasons. What would I do? I attended a shiur on this subject a few years ago. Sad to say, I don't remember all the details, but I do remember the jist of it. Up until sunset itself, you can continue driving. Beyond that, for the next forty-five mintues of so (during bain ha-shmashos - the time period between sunset and when it gets dark), you cannot drive, but you can have a non-Jew drive for you. Beyond that, you're out of luck. Even having a non-Jew drive for you won't help because you will end up travelling out of the techum Shabbos (the 2000 cubit limit in any direction in which you are allowed to travel on Shabbos). Well, the first rule of thumb, of course, is that if there is a danger to life, then you continue driving. At that shiur that I attended, the story was told of a nor'easter that hit the New York area on a Friday afternoon in December of 1992, which resulted in a blizzard in parts of New York. People returning from work that afternoon were having all sorts of problems: dangerous road conditions, traffic, whiteouts and traffic accidents. It soon became clear to quite a few motorists that they weren't going to make it home by Shabbos. In a panic, they called their Ravs asking what to do. Apparently many of these Ravs, in turn, called one particular posek for advice. His response: if it's a blizzard, drive on. Sakanas N'fashos (danger to life) overrides Shabbos. Since they could easily freeze to death in their cars if they pulled over, they would have to continue driving on. "However," he said, "you should tell all these drivers that this is a p'shia (case of negligence). Knowing that a blizzard was coming, they should have left work earlier, or perhaps even taken the day off if possbile. Now that they're on the road, they must continue - but the chillul Shabbos (Sabbath desecration) is at least partly their responsibility." But what if it's not a case of pikuach nefesh? What if I'm travelling along the road with my kids on a Friday and we break down - or hit traffic. I suppose if there is a town with Jews nearby, we could just drop in and hope to crash with someone (as much as I *hate* imposing on people - even family, let alone strangers - for anything). But what if it's literally in the middle of nowhere? Of course, there are numerous factors to take into account - the local weather, whether or not I have food with me or not, the ages and medical conditions of my passengers, etc. It would certainly seem strange to spend Shabbos camped out on the side of the highway (would the cops even let us stay there? What if they forced us to move?) eating whatever meager provisions we were carrying for our Shabbos "meals." Simple things that we take for granted, such as sleeping arrangements, using the bathroom (can't rip off leaves to use for toilet paper on Shabbos -- assuming that there are any leaves where you are), davening, etc. all become challanges. You can choose to stay in the car, where you'll likely be more comfortable at the outset - but then you won't be able to leave as opening or closing the door will result in the car lights going on or off. (Even if you disconnect the interior dome light, in most cars, a light will probably go off on the dashboard as well.) Or, you could choose to stay outside the car all Shabbos, but then you've got to hope that the weather doesn't turn unpleasant on you. Nothing like being stuck in a strong rain to dampen your Shabbos mood. Do any of my readers have "stuck for Shabbos" stories? UPDATE: Wow! It seems it was quite a weekend for people going to and from Baltimore to have trouble making it in time for Yom Tov. See here and here. ... the blog that we spoke about (that I recommended) is here.